A MAN is hoping to recover from a bacterial skin infection in time to take part in a fund-raising walk in aid of his son’s school. Adam Cotton, 39, of Gallowstree Road, Peppard, is one of 12 fathers of children at the village primary school due to take part in the 24-hour walk on June 16. They hope to raise £5,000 towards a temporary building at the school’s new playing fields for use as changing rooms from September. Mr Cotton, whose son Noah, seven, attends the school, spent a week in the Royal Berkshire Hospital in Reading being treated for cellulitis. 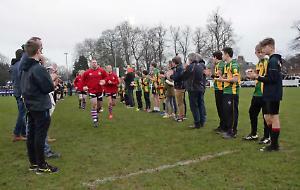 Mr Cotton was injured playing for the Henley Vultures, Henley Rugby Club’s veterans team, on March 29. He suffered pain in his right leg so he went to the doctor but an X-ray showed no fracture so he was given a course of antibiotics. His leg began swelling up so Mr Cotton visited accident and emergency twice in early April and was given stronger antibiotics but there was only a slight improvement in his condition. He was finally admitted to hospital on April 14. Mr Cotton, who runs SAT Worldwide, a currency transfer company based in Henley, said: “The hardest part has been not being able to do anything and I’ve been impatient and frustrated. He has now been able to ditch his crutches and hopes to restart his training. The fathers will leave Peppard Common after the school’s sports day and walk to Wallingford. They will then walk along the Thames towpath back towards Henley before returning to the school. Mr Cotton, who is married to Alison and has two other children, Sienna, four, and Bode, seven months, said: “Dads from some of the primary schools in Henley, who I know through the rugby club, are doing fund-raising so we thought why not do something for Peppard? “The fund-raising is good for the school and it’s good to get to know the other dads.